Tasty Tuesday: Roasted Butternut Squash Soup | For the Joy of Life. First things first, I just want to say thank you to all of you that follow along with Tasty Tuesday and trust my recipes enough to feed them to your families! It makes my day when I get an email, snapchat, or facebook message saying that you tried and loved a recipe. I have loved cooking since I was a little girl. Experimenting in the kitchen has always been a creative outlet for me and I just love sharing those creations with all of you! 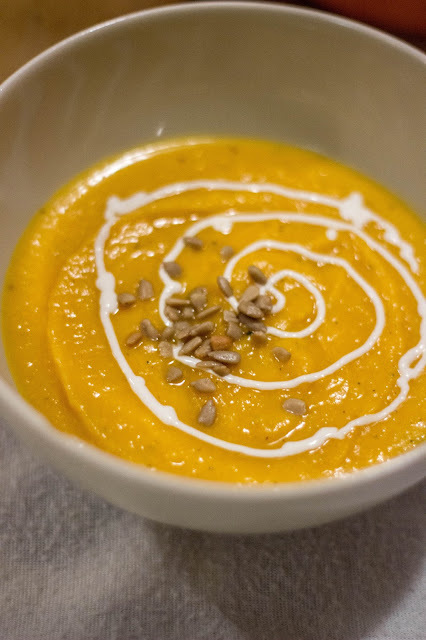 This week's recipe is the perfect fall soup! Butternut squash reminds me a lot of pumpkin. The way it feels, smells, and even tastes. I was pleasantly surprised that Hunter liked this recipe so much! Especially since I just kinda went with it and hoped for the best ha! I had to pair it with chicken because soup alone is not a meal to him, but he had two bowls! 1) Preheat your oven to 350 degrees. While it is heating, split your squash in half lengthwise. Scoop out all the seeds and fibers just as you would a pumpkin. 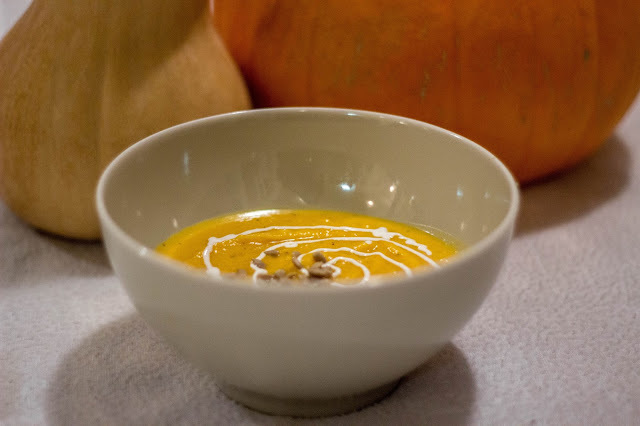 2) Season meat of squash with a few pinches of salt and place skin side up in a lightly buttered glass baking dish. 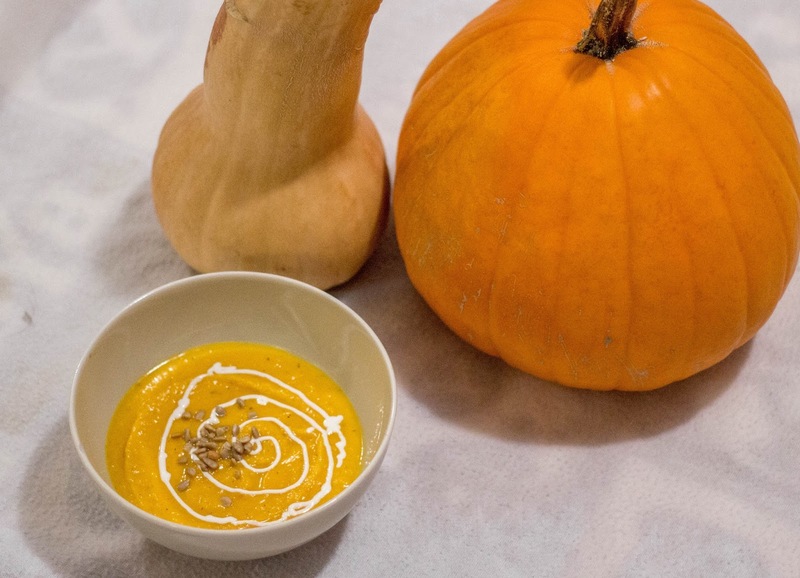 3) Place 1/2 cup water in the dish and bake the squash for 1- 1 1/2 hours or until skin is slightly browned in color and meat is tender when pierced with a fork. Seriously though, make sure it is really tender. 4) Scoop meat out of skin and set in a bowl. Try so hard not to burn your hands during this step. If you have all day, just try to let it cool before handling. If you don't, try a cookie scoop! 5) In a large soup pot, add your butter until fully melted. In the mean time dice your onion. Once the butter is melted and onion is diced cook together until onion is translucent. Don't let the onions brown! Add in your thyme, 1/2 teaspoon of salt, and bay leaf. 6) Add squash and mush it all together. I used a rubber spatula to scrape the sides and make it easier on me. Add in a few dashes of salt and pepper to taste. I added about 1/2 tsp of salt and 1 tsp pepper. 7) Add in your chicken broth and honey once squash and onion are combined. Bring to a simmer and let simmer uncovered for about 20 minutes. At this point you'll get the general taste so decide if you want to add any more salt and pepper. 8) Remove the bay leaf and now puree your soup one half at a time in either a blender or food processor. My little blender worked just fine! (see if you're an onion hater, it doesn't even matter anymore!) While it's blending rinse out the pot and dry. The reason for this is strictly in case there are leftover chunks that will not work with the now pureed texture. 10) Serve into bowls and garnish with a bit of sour cream (put in a ziploc and snip the corner to swirl) and some sunflower seeds! Obviously this one is a bit longer than my usual weeknight meals. I made this on a Saturday when Hunter was working all day and Oaks and I had nothing to do. I saved it in the fridge and we had it as a side for Sunday dinner the next day. It kept really well in the fridge for a few days and I just reheated it on the stove. 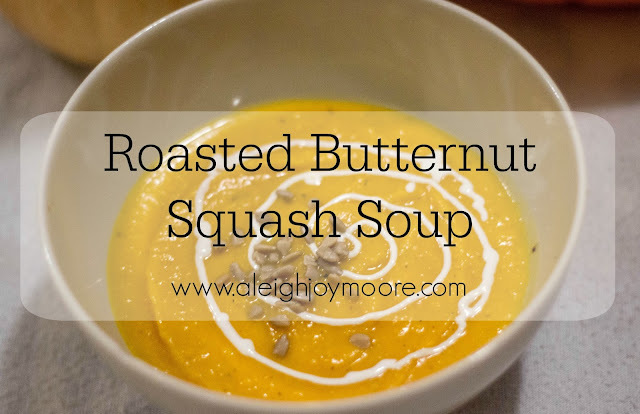 As always, let me know if you liked this recipe!